Ranging from painful periods to infertility, menopause to cervical cancer, pregnancy and maternal mental health, women’s health issues affect 50% of the global population. At The Future is FemTech we’re celebrating the pioneers of women’s health technology: companies using AI, wearables, bio-technology and more to solve today’s women’s health problems. We're speaking with the medtech experts, journalists, investors and policymakers to examine the gaps: where in female health are we lacking? We’re calling everyone who cares about femtech – health professionals, researchers, entrepreneurs, engineers, investors, global policymakers – this is a chance to discuss, network and drive business opportunities in a rapidly growing, billion-dollar industry. Janani is a doctor, teacher and healthtech evangelist. 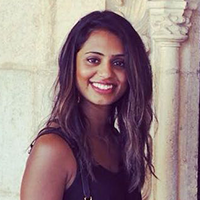 After completing her honours thesis in oocyte vitrification (IVF), attempting to found a startup and working as a medical practitioner in Australia, she moved to London to follow her healthtech heart.